TNPSC Group 4 results 2018: All the candidates who had appeared for the examination can check the results through the official website, tnpsc.gov.in. The exam was conducted in the month of February for the recruitment to the posts of 9351 vacancies. 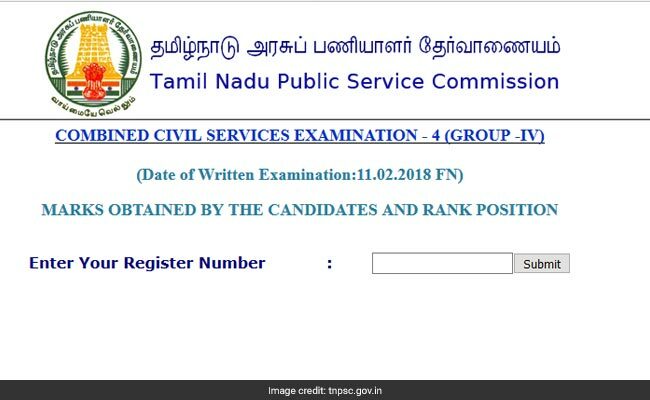 TNPSC Group 4 results 2018: Tamil Nadu Public Service Commission has released the results of Group 4 and VAO combined civil services examination – IV. All the candidates who had appeared for the examination can check the results through the official website, tnpsc.gov.in. The exam was conducted in the month of February for the recruitment to the posts of 9351 vacancies. Step 1: Visit the official website, tnpsc.gov.in. TNPSC group 4 exam was conducted in a single shift and a total of 200 objective type questions was asked. The candidates can obtain maximum 300 marks and the minimum qualifying marks are 90. The syllabus will be SSLC standard.